Have you ever wondered how the tradition of Christmas cards began? Well, it all started with Henry Cole in the 1840’s. 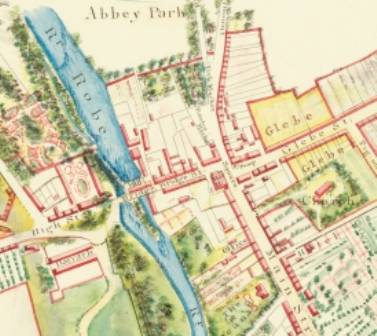 Henry Cole (later to become Sir Henry) was a very busy man, working in the Public Records Office in London. He wanted to send greetings to his family, many friends and acquaintances - but he simply didn't have the time to write a large quantity of letters. So he asked the artist John Calcott Horsely to design a card with a message in it - which Cole then sent out en masse. This image is of one of the original cards - it is now in the Victoria & Albert Museum in London, of which Henry Cole later became director. The centre panel depicts a family gathering - a scene that represents the Victorian focus on family unity and hearth and home. No doubt in this pre television era traditional entertainments were enjoyed such as singing, playing music, parlour games, miming and acting. The side panels of the card show scenes of feeding and clothing the poor - a representation of the prevailing Victorian sense of charity and duty to those less fortunate. 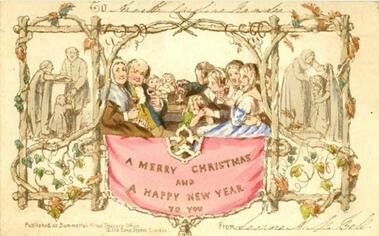 The card proved so popular that in 1843 Cole had 1000 printed and sold them for a shilling each - Cole shrewdly realised that people were prepared to spend a little more at Christmas. This page was added by Averil Staunton on 25/12/2013.